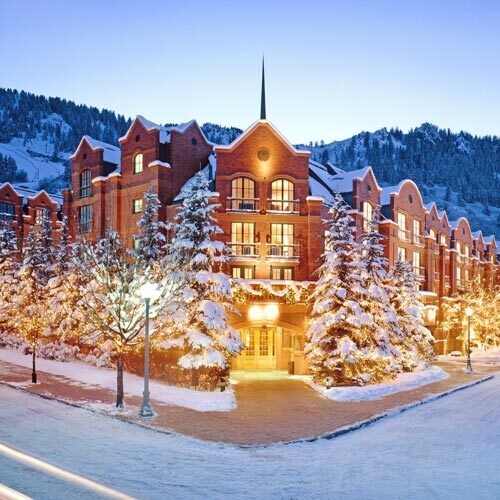 An elegant setting at the base of the mountain allows you easy access to skiing and shopping. The courtyard has been outfitted with a snow-melt system and warming fire pits for outdoor relaxation. Step out from the luxurious lobby to reach a courtyard with mountain views. Walk up the steps to reach the outdoor pool and hot tubs, surrounded by colorful landscaping. Unwind in the spa, which features a co-ed soaking pool with waterfalls and built-in chairs with their own water features. Each locker room has a cold-soak tub, a hot tub, and a steam room. Richly furnished rooms feature leather sleigh beds with adjustable reading lights, soft bed linens, and plush seating areas. Decorated in marble, the baths offer a separate shower with a rain showerhead, a unique soaking tub, and illuminated makeup mirror. Succulent plants add to the residential feel of the rooms. Some units offer mountain views and gas fireplaces. Smoke free premises. 179 units. 3-5 stories, interior corridors. Jct S Monarch and E Dean sts; downtown. 315 E Dean St 81611.
hot tub, downhill & cross country skiing, ice skating, recreation programs in winter, bicycles, trails, health club, spa. valet laundry, boarding pass kiosk, airport transportation, room service, area transportation-within city. closed 10/17-11/17 & 4/24-5/9, check-in 4 pm, pet friendly (call for restrictions/fees. ).